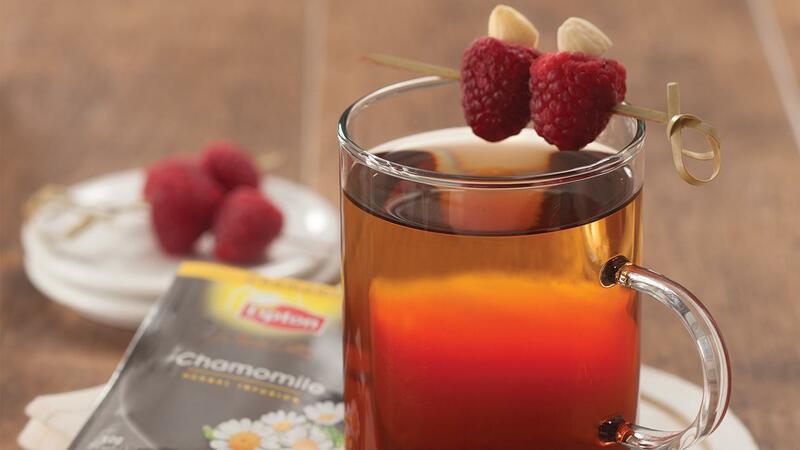 The unique and pleasant taste of chamomile tea will become a good choice for fresh drink. It will be freshen your day more when it is combined with hazelnut, gomme, and raspberry taste. Brew Sir Thomas Lipton - Chamomile with hot water in 2-3 minutes. Prepare a serving glass or jar. Pour the hazelnut syrup and gomme on it. Then, pour the raspberry syrup carefully to get some layers. Next, pour Chamomile tea carefully. Add the raspberry and almond as the garnish. Finally, New Champ is ready to drink.